Charles II., A.D. 1684, in his charter of this date, directs a fair or market for cattle, with a court of "Pye Powder" (pied poudre),* to be held annually on the first of March on "Le Dane John Field." 1794 "At the close of the last century, James Simmonds, an alderman, banker, and for some few years M.P. for the city, obtained a grant of the mound and grounds from the Mayor and Corporation for the term of his life, and subject to certain conditions respecting the rights of the citizens. On the 12th January, 1802, however, as recorded in the Burghmote book, Alderman Simmonds resigns all claims upon the Dane John Field, and surrenders his lease to the Corporation. An extract from his "Remonstrance," for so it may be called, will explain the reasons which induced him to take this step, and at the same time will give a history of the Dane John Field at this period. 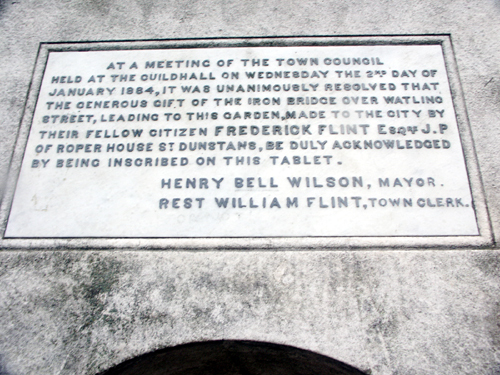 Alderman Simmonds writes in an injured tone, and in a grandiloquent style: The Corporation having accepted the surrender, resolve henceforth to devote the Dane John Field to recreation and amusement of the inhabitants, provided the latter are willing, by subscriptions or otherwise, to keep the grounds in order, and conserve the recent improvements. Alderman Simmond's remonstrance is as follows: "That he had laid out 1,500l. in improving and beautifying the grounds and buildings; had erected a brickway to support the Terrace that leads to the Ridingate, and paid Mr. Marseille* (who had a garden close by) 30l. per annum, to keep the grounds in order, besides allowing him the grass." The Alderman then adds: "When I first solicited the Court of Burghmote to permit me to alter the form of the Dane John Field, I had no other intention than, after having made that alteration, to have surrendered it again to the court in such a state as I conceived they would think most improved from that in which I found it, and in which rude and irregular shape it had lain beyond the memory of man, and at many parts of the year inaccessible to the public. The possible improvements of the ground, the various beauties of which there was so great a capability throughout the field, and the pleasure likelier to result to all the inhabitants of my native city from this undertaking, let me into a much greater expense than I had at first proposed. For this expense I have felt myself amply repaid by the universal satisfaction expressed by my fellow citizens, and by the repeated thanks by which I have been gratified by all ranks of people. 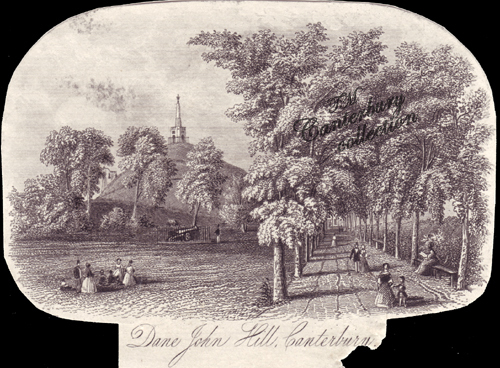 Indeed, they have done me the honour to say "the Dane John Field has become a public ornament to the city, conducive to the pleasure and health of all the inhabitants. To this place travellers and strangers resort as to a public spectacle, and, astonished at the singular beauties of the hill, the banks, and the plantations, have all of them declared that no city in the kingdom has within its walls any public walk or place of recreation to be compared with this." The Alderman then goes to say why he had solicited this grant of public ground during his life time, that he might beautify and improve it; and "that having expended more than 1,500l. in transforming a rude and irregular piece of ground into a beautiful promenade, and supporting the same at an expense of 40l. a year, he is placed in a list of defaulters with his poor neighbours by the court of guardians, and summoned before the justices for the non-payment of a poor rate of eight pounds per annum! When I saw the summons, continues the Alderman "I exclaimed "Gracious Heavens! what a return is this!" 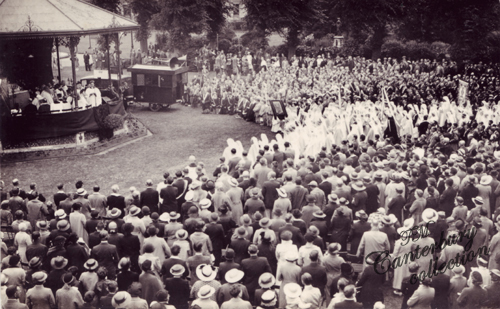 It was, we must own, hard and short sighted on the part of the guardians; if they had legal power to waive making the assessment, which possibly might have been done could it have been shown that no profit was derived from the grounds, especially as it was a place for public recreation. 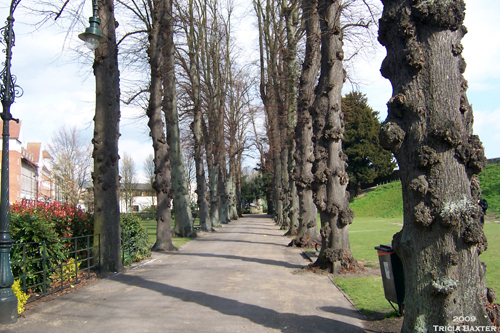 Amongst the trees then planted on the Dane John, poplar trees seem to have constituted the avenue. They must have flourished too, for twelve years later, every alternate tree, then valued at forty shillings per tree, was ordered to be cut down. All the poplars, save one or two only, have long since disappeared. 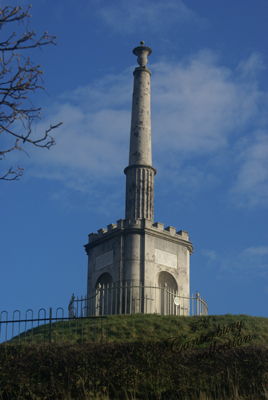 This place of public recreation, thus abandoned by Alderman Simmonds, the public erecting on the mound and ungraceful pillar to his memory, soon again became a waste - unkempt, untrimmed, if not uncared for, until some years later the Corporation did what they should have done long before, took it entirely under their charge, and appointed a ranger and assistants. Its present annual cost is now from 180l. to 200l. per annum. 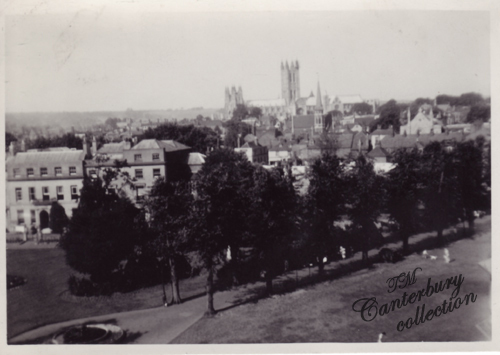 The Canterbury Fair was kept in the Dane John for some years after Alderman Simmonds had relinquished his wardship over it. 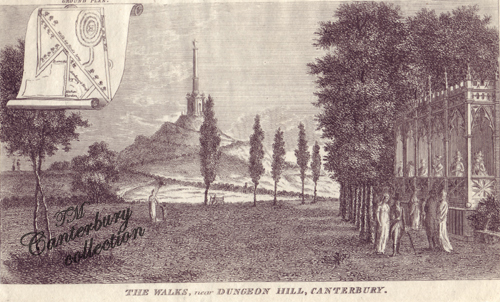 By an order of Burghmote, dated 2nd September, 1814, it was enjoined during the fair time, "that no damage be done to the walks, slopes, and fences." 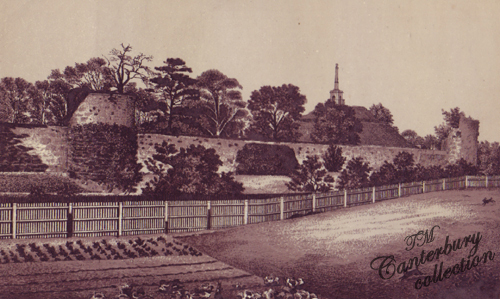 In July, 1812 the iron fence on the wall leading to the Ridingate was erected. 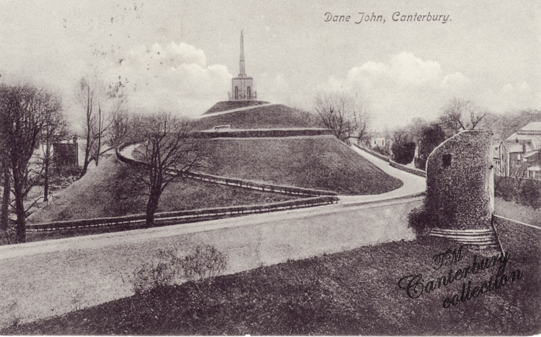 The city tower on the Dane John next to the Ridingate was removed in 1769. The gardener's cottage was erected by Alderman Simmond's in 1812. It was supplanted by a more commodious building in 1877. 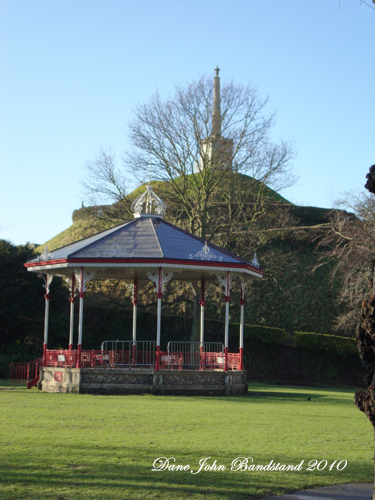 Somner describes the Dane John Mound as orginally entrenched, and, when first cast up, as lying outside the city. 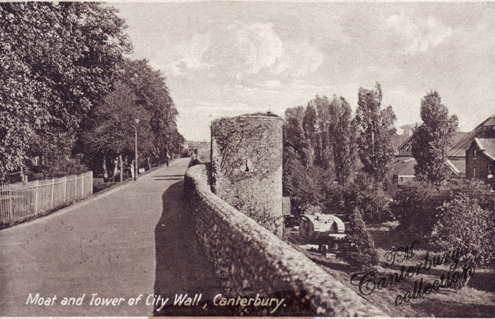 If this be a correct notion, it would be a fatal objection to the theory entertained by some antiquaries that the wall outside the mound was part of the circuit of Roman Canterbury. 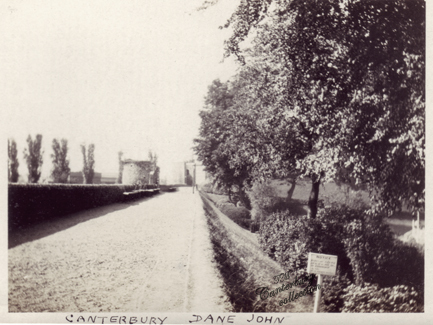 At the close of the 17th century, the Dane John was used as a place for military executions. From entries in the book of the parish clerk of St. George, kindly communicated by the rector, we learn: "9 November, being All Saint's in the year 1694, a solddyer in the regt. of Col. Coote was shott to death on the further Dane John, the day above written, and buried in the chapel yard in common ground." Again, July 9, 1696, "A soulger in Col. Tittcome's regt. was shot for desertion, and in the nether Dane John, and buried at the same place where he was shot." 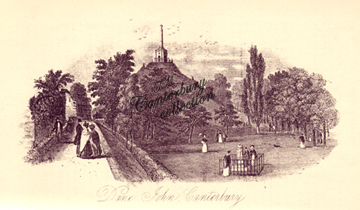 *Among the prints relating to the history of the city, in the Canterbury Museum, is an engraving of the Canterbury Catch Club in 1826; a large company of convivialists at a table, each with a churchwarden pipe, or yard of clay, and a tankard or a wine-glass or a spirit rummer before him, and the motto "Harmony:Unanimity" on the ceiling above. The names of these jovial whiskered fellows are provided in a key, all of them save two earning their living, the president being Mr. Charles Delmar, brewer, and the two exceptional members without any low traffic with toil being Mr. Marseille, gentleman, and Mr. Hollingbury, gentleman. If the name of Mr. Wickfield lawyer, is not here it is because, I feel sure, he joined later than 1826"
1820, New Monthly Magazine - Canterbury. The orchestra upon the Donjon Field, has been lately removed. 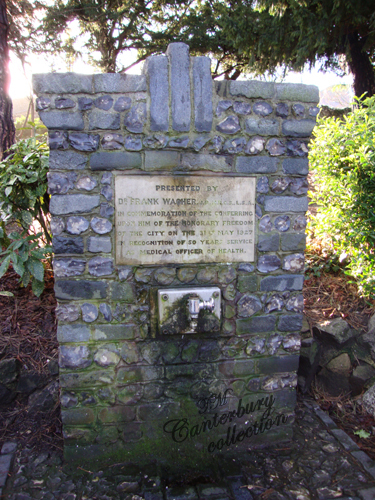 An adjoining piece of land having been presented to the public by Mr. George NEAME, a subscription is commenced for the purpose of enclosing it, extending the shrubbery, and making further improvements, under the direction of a committee of the corporation of the city. 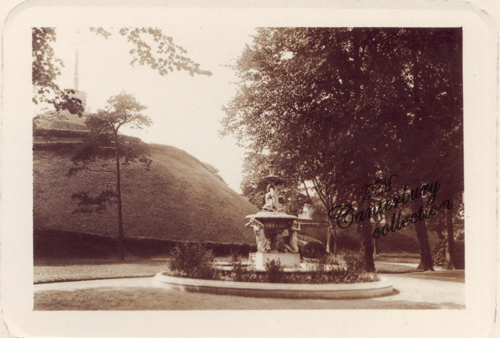 "Two or three hundred yards from thence is a Danish mount, giving its name to the manor*, from whence we have a pleasant prospect of the city and the county round about it. It is commonly called Dungil, or Dane John Hill, some suppose from being thrown up by John, a Dane, others from the French word donjon or dongeon, a high tower in old fortifications. This, and two smaller mounts not far from it, are looked on as works of the Danes when they besieged our city in King Ethelbert's time. The city wall was afterwards carried round so as to take in this high one for its defence. 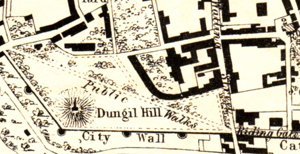 Going from Wincheap eastward without the city wall, we see the two little mounts mentioned, behind one of which is a range of buildings, once outhouses to the old capital mansion of Dane John." "On the top of this hill, some time since, there stood a windmill, which has been removed many years ago. Leland, who wrote in king Henry VIII. 's time, says, in his Itin. vol. vii. p.145. "Many yeres sins men soute for treasor (since men sought for treasure) at a place cauled the Dungen where Barnhales house is now and ther yn digging thei found a corse closed in leade." "The Dungeon, or Danejohn-field, for it is at present known by both these names, lies near the site of old Riding-gate, adjoining but within the walls of the city, at the south-east corner of it, and on the west side almost to the ditch and wall of the castle bayle. In antient deeds the name is variously written Dangon, Daungeon, and Dungen; names all much alike and of the same import. The Whitstable Times and Herne Bay Herald, Saturday, June 30, 1877 - Band on the Dane John. In reply to a letter from the Mayor (W. H. Linom, Esq.) 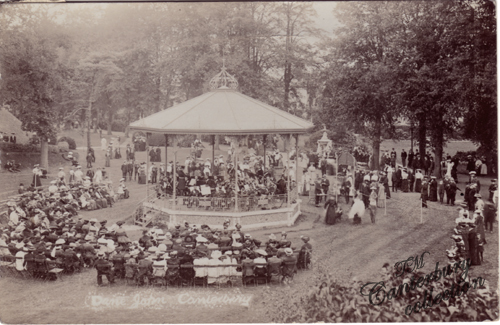 written at the request of the Chamber of Trade, Colonel Conyers Tower, the commandant of the Cavalry Depot, has kindly consented to allow the Depot band to play on the Dane John every Thursday evening during the summer months from 5 to 7 o'clock. It is to be hoped the inhabitants will show by their attendance in large numbers that they appreciate the kindness on the part of the commandant of our garrison. At the south-east corner of this field, close to the city wall, there is thrown up a vast artificial mount, or hill, now to all appearance circular, having a deep ditch, from which no doubt the earth was taken round the other part of it; it is a great deal higher than the wall ever was, when entire; insomuch, that from the top of it there is a clear view over the whole city below it, as well as a great extent of the adjacent country; the field itself, before the late alterations, consisted of very uneven ground, and whatever had occasioned it, had never been levelled. On the outward, or opposite side of the wall to the above mount, the city ditch and a high road only separating the two, is another artificial mount, of a much smaller size and not half as highz. This place was esteemed of such consequence, that it gave name to the adjoining manor of the Dungeon. The original of its name is conjectured to have arisen from its having been the Danes work, and to have been from thence corruptly called Dangeon and Daungeon, for Danien or Danes-hill; and that, because it was either their work against the city, or of the city against them; but the former appears, by what follows, to be much more probable. 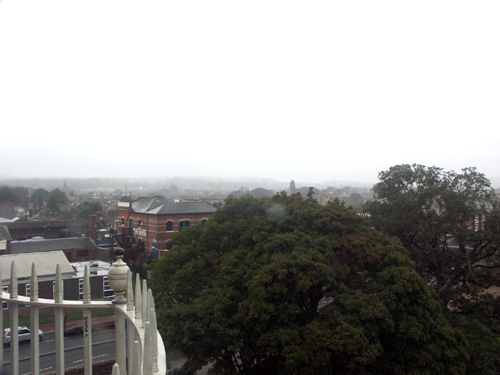 Indeed, it seems to have been the proper work of the Danes, the great and frequent molesters, invaders, and wasters of this city, and most likely at the time when in king Ethelred's days they besieged the city, and after twenty days resistance, took it by storm, and then destroyed both city and inhabitants. z - The field or meadow, at the north west corner of which this small mount stands, is of like uneven surface as the other. It is usually called the Martyr-field, from several persons having been burnt in a large hollow or pit at the south end of it in queen Mary's reign, on account of their religion. 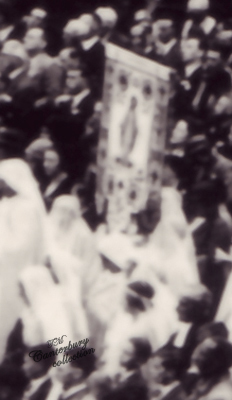 See Fox's Martyrs, vol. iii. "On the lawn is an exquisitely sculptured sundial by the celebrated Weeks, a native of this city. On the pillar, in bold relief are classical figures of the Seasons." "There are several entries in the Records in respect of the above locality. It appears to have been the property of the citizens from time immemorial. Here they shot at the butts with arrows, and here at a later period they practised at the target with "blundering musquets," culverins, and other fire-arms. 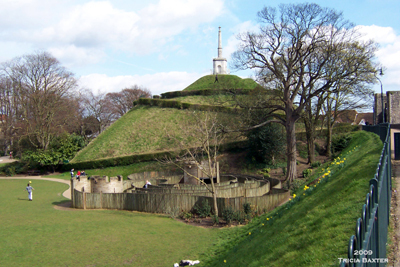 Much speculation has been hazarded respecting the origin of the Mound, and some antiquaries have considered it to be an erection analogous to Silbery Hill, and other tumuli, coeval perhaps, with the ritual of the Sabean or Druidical form of worship. The name assigned to the Mound is variously written"Totam terram nostram quam habuimus ad Dangonem," Danzonem; also, "in campo qui voctor Dangun," in a deed, 14th Edward I.; likewise "juxta le Daungeon," as also in old rentals of the Cathedral, *and Roger Brent in his will, dated 1486, mentioning his manor there, calls it so, and the hill hard by "Dungeon hill." The common and prevalent impression is that the name is a derivative from the Danes, as if of the Danes, "Danes' work," being the production of these marauders in some attack upon the city. But its propinquity to the Castle, and its similarity to the Donjon Mounds commonly erected near the stone castles of the Norman proprietors, appear to point out both its origin and its denomination. Leland, who wrote in his Itinerary in the time of Henry VIII., informs us that many years previous to his time, men seeking for treasure "at a place cauled the Dungen, where Barnhale's house is now, and ther yn digging, thei found a corse closed in lead." On the Mound, we are also informed, an ancient windmill once stood. 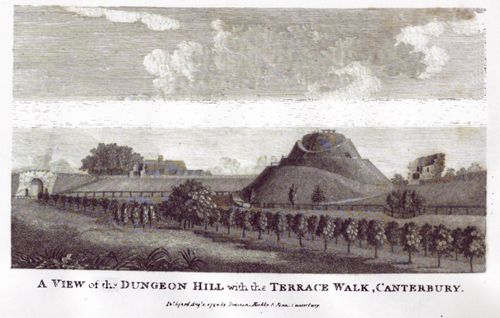 There were anciently two mounds, and the one which remains was once covered with oaks, which, in the time of Elizabeth, a certain Hugh Johns was permitted to cut down, "provided he plant twenty ashes or elms and keep them to grow." 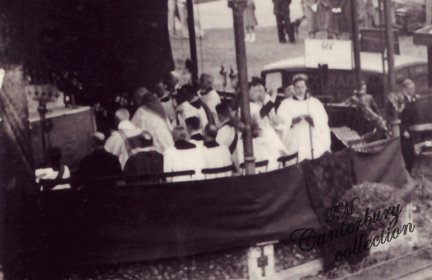 Can anyone tell me when & what this gathering in the Dane John was all about? 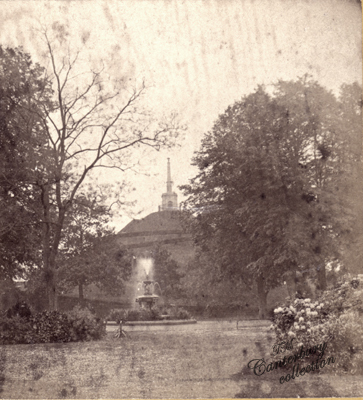 "This from early times was the citizen's ground where they indulged in sport or archery - and in after years- in musketry practice at the butts. There where originally according to Brent - two mounds, a lesser which stood on the other side of Watling Street, overlooking the present cattle market, and the greater which still remains. In 1286 it is mentioned in some old writings and called "Daungeon," and it is probable, if the name is a corruption of "Donjon," that it was at one time surmounted by a small keep, and used as a look-out mound for the Castle guard. In 1643 it did serve such a purpose, an improvised guard with ordnance being mounted there. 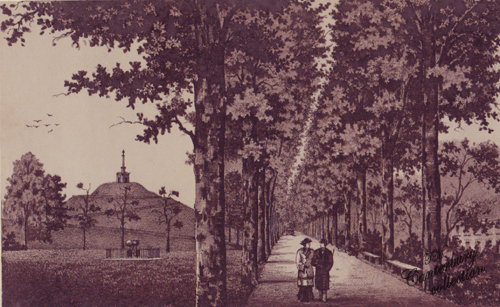 A spiral path leads to the summit on which stands a memorial, signalizing the improvements carried out by Alderman Simmons in 1790. 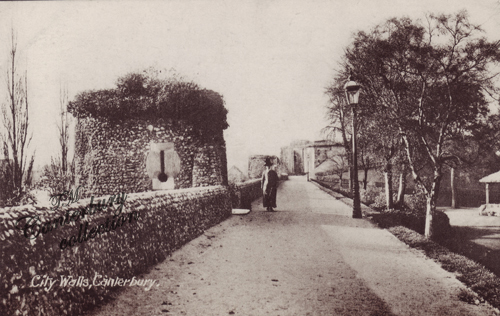 The path running along the embankment traverses the rampart of the old city wall, from which the moat below, now converted into a market garden, may still be seen. The river was formerly diverted to fill it. Four of the watch towers remain, the first which we pass at the top of the ascending path being known as the White Cross Tower, so called from the cross of Caen stone let into the face of it below to commemorate the martyrdom in the Martyr's Field opposite. It can be seen from the roadway beyond when the pear tree below is not in leaf. **Mr. Cecil Gann lived at Cremona Villa on Whitstable Road in the early 1900's, and was a Professor of Music who was born in Canterbury.